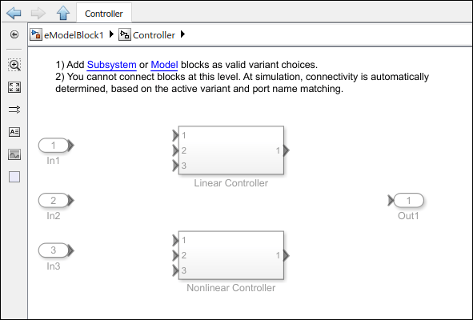 The components of a Simulink® model that contain Variants are activated or deactivated based on the variant choice that you select. Each variant choice in your model is associated with a conditional expression called variant control. Variant controls determine which variant choice is active. By changing the value of a variant control, you can switch the active variant choice. While each variant choice is associated with a variant control, only one variant control can evaluate to true. When a variant control evaluates to true, Simulink activates the variant choice that corresponds to that variant control. A variant control is a Boolean expression that activates a specific variant choice when it evaluates to true. You can specify variant controls in the MATLAB®global workspace or a data dictionary. You can specify variant controls as Simulink.Variant objects, MATLAB expressions (including structures) or as expressions that contain one or more of these operands and operators. 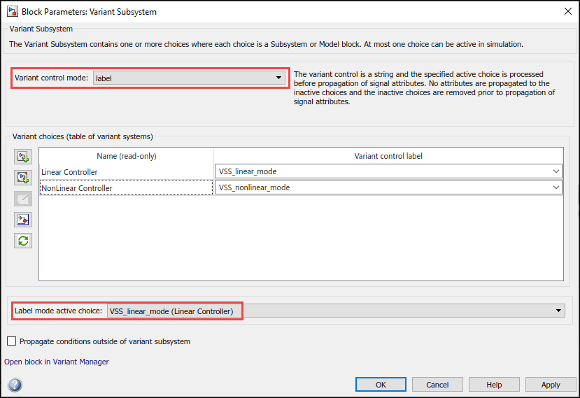 Variant control mode parameter available in the block parameters dialog box allows you to select Expression or Label mode for modeling Variant blocks. Expression: Specifies the active Variant based on the evaluation of the Variant conditions. Label: Specifies the name based Variant controls (Label mode active choice). In Label mode, Variant control need not be created in the global workspace. Alternatively, you can select the Label mode active choice from the command line. For example, set_param(block,'LabelModeActiveChoice', 'Choice_1'). For more information, see Operators and Operands in Variant Condition Expressions. When you compile the model, Simulink determines that a variant choice is active if its variant control evaluates to true. The evaluation of active variant happens in the early stages of compilation and the active variant cannot be changed once model is compiled. Simulink variant objects within structures are not allowed. Simulink parameters within structures are not allowed. You can use many approaches for switching between variant choices—from options to use while prototyping to options required for generating code from your model. You can find control variables using the function Simulink.VariantManager.findVariantControlVars. Scalar MATLAB variables allow you to rapidly prototype variant choices when you are still building your model. They help you focus more on building your variant choices than on developing the expressions that activate those choices. Consider a model that contains two variant choices, each represented by a Variant Subsystem block. You can specify variant controls in their simplest form as scalar variables in the block parameters dialog box of the Variant Subsystem block. The Condition field for both the Linear Controller and Nonlinear Controller are N/A, because the variant control itself is the condition. You can activate one of the variant choices by defining a scalar variable V and setting its value to 1 at the MATLAB Command Window. This condition activates the Linear Controller variant choice. Variant controls are ignored when % symbol is used. Similarly, if variant control is empty, the choice is ignored. Similarly, if you change the value of V to 2, Simulink activates the Nonlinear Controller variant choice. After identifying the variant choices that your model requires, you can construct complex variant conditions to control the activation of your variant choices. Define variant conditions as Simulink.Variant objects. 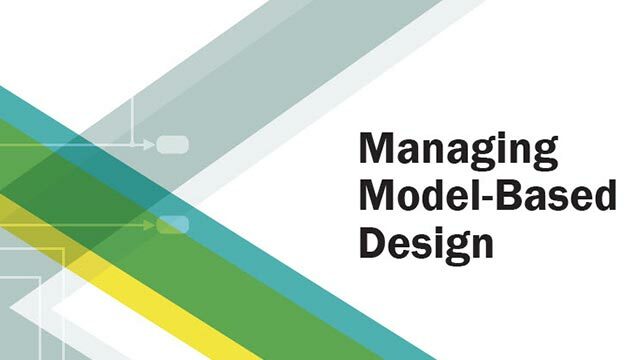 Simulink.Variant objects enable you to reuse common variant conditions across models and help you encapsulate complex variant condition expressions. Consider an example where variant controls are already defined in the global workspace. You can convert these controls into condition expressions encapsulated as Simulink.Variant objects. 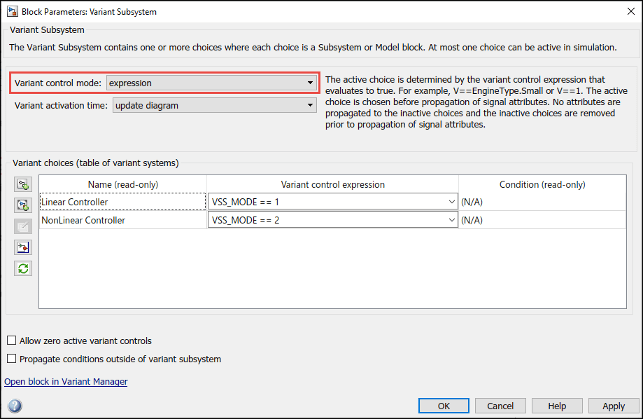 You can then specify these Simulink.Variant objects as the variant controls in the block parameters dialog box of the Variant Subsystem block. The Condition field now reflects the encapsulated variant condition. Using this approach, you can develop complex variant condition expressions that are reusable. If you intend to generate code for a model containing variant choices, specify variant control variables as MATLAB variables or Simulink.Parameter objects. Simulink.Parameter objects allow you to specify other attributes (such as data type) that are required for generating code. You can also convert a scalar variant control variable into a Simulink.Parameter object. See Convert Variant Control Variables into Simulink.Parameter Objects. Use enumerated types to give meaningful names to integers used as variant control values. In the MATLAB Editor, define the classes that map enumerated values to meaningful names. Define Simulink.Variant objects for these classes in the global workspace. Using enumerated types simplifies the generated code because it contains the names of the values rather than integers. The Variant Condition Legend helps you visualize the variant conditions associated with a model. To view the Variant Condition Legend, click Display > Blocks > Variant Condition Legend. The Variant Condition Legend is available only when Display > Blocks > Variant Condition is active. By default, the Variant Condition Legend displays the variant condition annotation and the variant condition during simulation. To view the variant condition in the generated code, select the Show generated code conditions option on the Variant Condition Legend. In the Variant Condition Legend, the variant conditions on the blocks are annotated as v:c, where v is the variant semantic indicator and c represents the variant condition index. You can click through the hyperlinked variant annotations to observe which parts of the model the condition corresponds to. When you hover over a block that has a variant condition, the tooltip displays the variant annotation and the related variant condition for the block. To view the variant condition annotation tooltip, the Variant Condition option must be selected. To view the Variant Condition Legend programmatically, use the Simulink.VariantManager.VariantLegend function in the MATLAB command window. Variant condition expressions can contain MATLAB operators, provided the expression evaluates to a boolean value. In these examples, A and B are expressions that evaluate to an integer, and x is a constant integer literal. If the value of the second operand (B) is 0, the behavior is undefined.